Cloud storage is important when using a college-owned device as it backs up information and files stored on the device. On your home screen, open Settings by selecting the icon. In Settings, scroll down to iCloud, and select it. In iCloud, scroll down to Backup, and select it. Turn iCloud Backup on. You can also return here to manually backup when you wish. Click on the device icon in the upper left-hand of the screen. 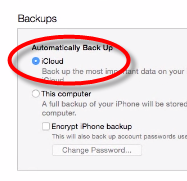 In the summary section, under Backups, select automatically back up to iCloud. Overview of iCloud and auto backup for iTunes.